In collaboration with National Art Museum of China and China Cultural Centre, The Parkview Museum Singapore presents BREEZING WILLOW. Spring has come. New Year paintings are displayed and integrated into the atmosphere of New Year festivity with their beloved distinctive style as well as joyful, propitious content — a form of enjoyment for the ordinary folks during a year’s end. New Year paintings are an embodiment of longing for happiness as well as the joy of harvest for these folks. The idyll and liveliness of the palette, simple yet interesting qualities of the imagery, the evoked feelings of joy; these are basic characteristics of the beloved paintings. Like colours of flowers blooming in a fine garden, New Year paintings are an indispensable part of Chinese ethnic culture. In today’s era of pursuing dreams and ambitions, not only do they have a deeply rooted heritage; New Year paintings are widely practised and celebrated — a harbinger of the golden age of art and literature. The term, culture, refers to all works of creation, both material and immaterial; New Year paintings originating from the people are ebullient with pure joy and emotion. Filled with bold imagination and creativity, they are closer to a man's nature and the creators’ true self; these works are enlivened through art while deeply rooted in the ordinary. The many styles and features of New Year paintings from various regions of China have enriched the wisdom within archives of folk creations, while simultaneously portraying the diverse nature of beauty. 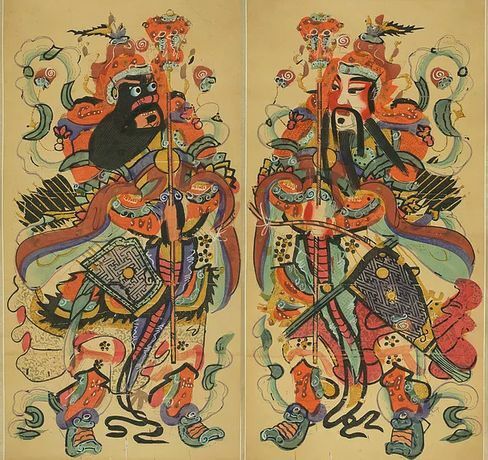 Over 100 ancient classic New Year paintings from Yangliuqing are selected dating from the Kangxi Period of Qing Dynasty till the period between late Qing Dynasty and the Republic of China, including many precious manuscripts as well as only copies that exist. The exhibition displays a complete showcase of styles and features of New Year paintings from Yangliuqing through various aspects, such as themes, purposes and processes, conveying the thought processes as well as aesthetics present in these traditional New Year paintings. To showcase the unique charm of Chinese traditional culture and strengthen artistic exchanges between Singapore and China, The Parkview Museum Singapore, National Art Museum of China and China Cultural Centre jointly present an exhibition of exquisite New Year paintings and express their sincerest blessings for the festive occasion.